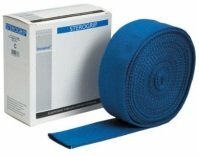 Tubigrip compression bandages are very simple to use and come in a variety of colours and sizes. They are a great tool for reducing swelling and providing support for all sorts of causes of minor knee pain. It is essential to get the right size and to apply tubigrip correctly to ensure it works effectively and safely. Too loose and it won’t reduce swelling or provide support, too tight and it can be uncomfortable and could reduce circulation (blood flow). Tubigrip should feel tight but not restrictive. Here you will find answers to the most commonly asked questions on how to use tubigrip compression bandages. To find out more about how it works, visit the tubigrip overview page. 1) What is Tubigrip Compression Bandage? It is a specially designed elasticated tubular bandage that provides firm but comfortable support for sprains, strains and weak joints. It can also be used to reduce swelling and to keep dressings in place. To find out more about how it works, visit the tubigrip overview section. 2) How Do You Apply Tubigrip? Tubigrip compression bandages should cover the relevant joint extending up to just below the joint above and down to just above the joint below e.g. for the knee it should go from just below the hip to just above the ankle. Tubigrip should always be applied double thickness for it to work effectively. 3) Fold it over at the bottom and extend it upwards, stopping a couple of centimetres before the top. 3) Where Can I Buy It? 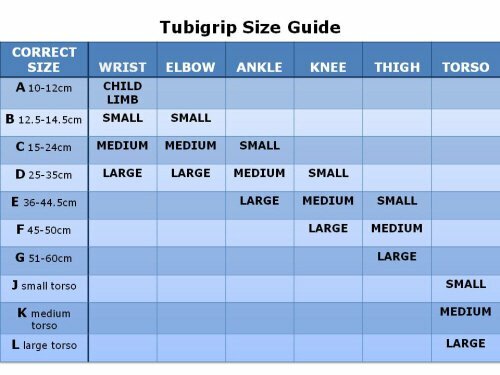 Tubigrip compression bandages come in a variety of sizes, lengths and colours. We’ve reviewed tubigrip stores for US customers and UK customers and we’ve cherry picked the best prices taking into account delivery cost and reliability. 4) Which Size Do I Need? Measure around the centre of your joint (e.g. knee) to get the circumference and check on the table below. 5) How Do You Keep Tubigrip in Place? One of the great things about tubigrip is that it usually stays in place by itself. However, occasionally people find that tubigrip rolls down at the top slightly, especially on legs. My top tip is to get a coin and fold the top of the tubigrip over it and that should keep it in place. A coin with straight edges e.g. 50p GBP coin often works best. 7) What Lengths Can I Buy? Tubigrip usually comes in 10m rolls but sometimes comes in 0.5m or 1m sizes too. Visit our recommended US suppliers or UK suppliers for the best prices on a range of tubigrip products. 10m: The most cost effective way to give you enough to allow for double thickness and to give you a spare for when one needs washing. 8) What Colour is Tubigrip? It is available in either creamy beige, natural skin or blue colour, depending in what country you live. You cannot get black tubigrip. Visit our recommended US suppliers or UK suppliers to find what colours are available to you at the best price. To find out more about tubigrip compression bandages, including how they work, what they are made from and why they are better than other bandages, visit the Tubigrip Overview section. If you are looking for the best prices for buying tubigrip, visit our recommended US suppliers or UK suppliers to find whatever size and colour you are looking for, at the best price.